Another Purim or Hadassah meeting treat: candied cinnamon and sugar almonds. Do not ... I repeat, DO NOT taste any, not even to see if they are done. Just package them up in really pretty gift packs, and do it fast before you weaken. Make them and get them out of the house. They are like crack. You will be unable to restrain yourself from eating the entire batch, stopping only occasionally to breathe (and to lick your fingers). I found the original recipe at Mel's Kitchen Cafe, but unlike most of the recipes I steal adjust, there was no need to make any changes. If you can't find unsalted almonds, use the salted kind and omit the added salt. Sorry, no photos this time, unless you visit the original source. Purim this year starts the evening of March 18th. The Reader's Digest version of the Purim story is that Queen Esther helped saved the Jews of Persia from the evil Haman. Purim is celebrated nowadays by everyone coming to services in costume, adults as well as children, and reading aloud the unabridged version of the Purim story. Whenever Haman's name is mentioned, everyone makes a lot of noise, blowing horns and spinning groggers (noisemakers) to drown out his name. Afterwards, we all party-hardy. Another fun tradition is delivering cookies and other goodies to neighbors and friends. Kinda sorta like Halloween in reverse. The traditional cookies found in the traditional purim basket is hamantaschen. But starting today, I will be posting alternatives to make your purim basket really outstanding. If it ever makes it out of your house. I had the good fortune to have all the traffic lights with me for a change, so I got home from work tonight about 5 minutes early (out of my usual 15). Gina's Skinny Recipes happened to post a garlic-cheddar biscuit recipe the other day, similar to that served in many seafood restaurants. And I happened to be, making a fish dish tonight. Since I had all this extra free time, I celebrated by making a batch of those biscuits. There are some days when there is no interesting recipe amongst the 130 food blogs I research daily (see this post on how I keep track of them all yet stay mostly sane). Other times, such as today, I find as many as four of interest. 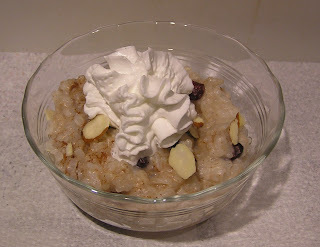 The one which I actually had most of the ingredients for a change was for an almond rice pudding. What makes this pudding different from all other puddings (sorry, channeling wrong holiday) is that it specifically calls for no eggs and no milk/cream. Wait ... aren't those 2 little ingredients like a major part of rice pudding? Won't the result taste kinda ... I dunno ... AWFUL? Wrong, wrong, wrong! This rice pudding holds its own. Almond milk is not very high in fat, despite originating from a high-fat nut, and the flavor is surprisingly mild. 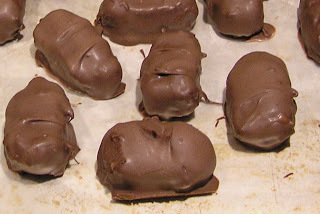 Cooked down, it gives the pudding a very creamy taste and yummy mouth-feel. You, your hips and your cholesterol count won't miss the dairy at all. Way back in December, I won a Limited Edition Muir Glen Reserve Kit, courtesy of The Spiced Life. Four cans of Muir Glen tomatoes, packed in the cutest wooden mini-crate, along with a menu-style recipe booklet. Although I was quick to thank Laura (and Alex for randomly selecting my entry), I have been quite tardy in actually using some of my well-gotten gain. Until today! Huzzah! 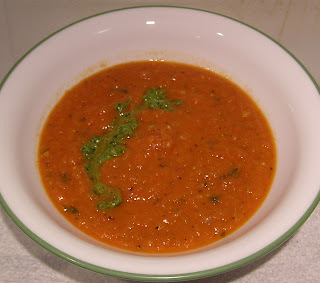 I made tomato soup!